20th century wartime propaganda conveyed a broad set of ideological arguments in radically different forms depending on its medium and, by extension, its intended audience. While the specific ways in which such propaganda is manifested in comics of the period –entertaining and fantastical – are particular to their readership of children and adolescents, the underlying themes and arguments are born out of the same pro-war, nationalist ideology that motivated propaganda directed at a more general audience. Despite the fictionalized, cartoonish elements of these comics, it is evident upon a closer reading that the propagandistic motivations that drove their production were intended to effect real-world consequences, and saw their target audience of children and adolescents as playing an active role in the war effort. This is evident in issue no. 7 of the Canadian comics series Active Comics (1942), in which two war-stories (“Dixon of the Mounted” and “Thunderfist”) set particular geopolitical conflicts of the Second World War in North-American contexts (Canadian and American, respectively). Both strips present scenarios in which the conflicts of the war are thrust into the North-American sphere as a result of covert invasion, following Canadian and American civilians directly contributing to their respective country’s war effort by exposing and taking up arms against foreign spies. By situating their stories in a North American context, these strips frame a foreign conflict that could seem detached from Canadian life as more familiar and immediate, and thus more relatable to the average Canadian youth. While Canadian youth were unlikely to be in the scenarios presented in these strips, they nevertheless intended to introduce them to the idea that they, as citizens, were not completely removed from the war. Ultimately, these comics were meant to encourage young Canadians to forge a personal relation between themselves and the war effort, and sought more broadly to instill the concepts of patriotism and civic responsibility into their culture. To understand what exactly the propaganda peddled by Active Comics no. 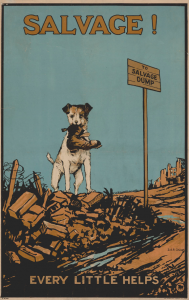 7 is in response to, it is crucial to examine the politics surrounding war at the time – specifically, the emergence of isolationist thought in North American foreign policy during the interwar period. Contrary to the view that isolationism was a distinctly American phenomenon during this period, recent scholarship has provided a more nuanced history of the ideology’s influence on Canadian politics and culture, and has particularly shed light on the distinct qualities Canadian isolationism took on in relation to that of its southern neighbour. In English-speaking Canada, traces of isolationist thought only began to seriously pop up in mainstream discourse during the interwar period, particularly the 1930’s. This was born less out of a reaction of disillusionment against the foreign policy that led to the First World War (as was largely the case with the United Sates’ adoption of isolationism) and more out of an emerging ideology of left-wing, anti-empire nationalism (Spruce 3, 14). While the vast majority of Anglo-Canadians maintained loyalty to the increasingly distant British empire through the interwar period (Spruce 14), a growing vocal minority led by the likes of historian Arthur R.M Lower began to challenge Canada’s ties to its motherland and sought to turn away from colony-status toward an independent country. In the wake of 1931’s Statute of Westminster, Canadians were forced to re-evaluate what role their country was able to (and ought to) play in regard to foreign warfare (Spruce 5). With most political ties to the United Kingdom now cut, why should that autonomy not extend to Canada’s military?, asked the emerging isolationists. This was a question not just of cultural identity, as Robert Bothwell notes, but of economic capacity. Canada, still a developing country in the minds of many of its citizens at the time, was clearly economically distinct from the wealthy British Empire its military was subordinate to; in light of this and of the domestic wealth inequality that plagued post-war Canadian society, Canadians were reconsidering the obligation they had in assisting their wealthier, more powerful allies in war efforts that did not directly concern them (Bothwell 79). Such populist sentiments were eventually quelled following the Second World War with the introduction of the modern social safety net (Bothwell 80), but in the meantime, they were an effective rhetorical tool that spoke to the immediate concerns of impoverished Canadians left behind after the Great War. In all their different forms, these assertive articulations of Canada as an autonomous nation that came out of this interwar period continued to inform the country’s foreign policy well into the Second World War, with the Canadian delegate to the League of Nations, Raoul Dandurand, declaring in 1942: “We live in a fire-proof house, far from inflammable materials” (Stacey 61). While isolationism as such never exceeded beyond being anything more than marginal ideology in the Canadian political milieu, isolationist ideas had a profound influence on the changing notions of Canadian identity as it continued to transition from a colony to a sovereign state; and by the Second World War, pro-war propagandists were tasked with beating back against such ideas to prevent them from becoming fully lodged in Canadian culture – particularly among Canadian youth, who were growing up in a country with radically changing conceptions of patriotism. The isolationist-adjacent views regarding Canada’s relationship with the British Empire logically resulted in a broader feeling of detachment from European affairs as the country forged a distinct North-American identity. This was problematic for Canadian pro-war institutions, which now faced the problem of selling the country’s populace on conflicts that almost exclusively concerned foreign states, to which Canada had an increasingly limited connection to, both politically and culturally. Consequently, propaganda during the Second World War concertedly served a fear-mongering function, stoking anxieties surrounding invasion and foreign spies among Canadians. By promoting the possibility of an invasion of the homefront (whether covert or overt), a war that might have been thought of as a purely Eurasian conflict suddenly posed a direct threat to the lives of Canadians. Invasion propaganda was typically conveyed through mediums of entertainment – films, novels, and comic books, namely. Adopting such mediums served two main purposes: firstly, it ensured a broad and engaged audience; and secondly, it exploited fiction’s emotionally manipulative functions, maximizing the amount of fear elicited. Since the production of entertainment was predominately privately controlled, the Canadian government’s role in disseminating fear-based propaganda was largely carried out through propaganda’s counterpart: censorship. More specifically, which pieces of entertainment the government chose to censor, and which they chose to permit. Such decisions were carefully calculated; the exact boundaries of the Overton window the government demarcated reveal the sorts of ideas it wanted shaping Canadian culture. For example, at the beginning of the war, two films – All Quiet on the Western Front and Lest We Forget – were deemed “anti-war” by government officials and subsequently banned, while the invasion-oriented Confessions of a Nazi Spy was granted a “government blessing,” and immediately given an “extended run” in Manitoban theatres (“Canada Nixes”). Clearly, the appropriateness of war-related media was determined primarily by their propagandistic functions, which logically resulted in the government-accepted themes of invasion, xenophobia, etc. being echoed in privately-produced entertainment thenceforth, including the stories published in the Canadian Whites (Judy and Palmer 66). Fig. 1. T.A Steele. Frame from “Dixon of the Mounted.” Active Comics, no. 7, August 1942, p. 1. Bell Features Collection, Library and Archives Canada. The “Dixon of the Mounted” strip found in Active Comics no. 7 is an example of the increasingly ubiquitous ‘invasion stories’ that populated this period; it follows a Canadian Mountie in his pursuit of a gang of German spies who have breached the country. The comic draws on a wartime tradition of dehumanizing Germans, portraying the German spies as beastly, inhuman characters, seemingly devoid of morality and reason. Set in contrast to Dixon – a symbol of Canadiana who upholds his country’s virtues by giving his enemies a chance to surrender, and shooting to wound (at first) – the German spies are characterized by their lack of conscience: they view killing as a game, “celebrating” their supposed shooting of Dixon, and have no qualms about murdering a Canadian civilian (Steele 3, 6). The spies’ inhuman character traits are reinforced by their visual depictions; they resemble Frankenstein’s-monster-esque creatures, drawn with heavily shaded, sunken-in eyes under thick, low-set brows that connote cold insensitivity (fig. 1). This characterization is in line with other representations of Germans of the period; from the early 20th century, Germans were stereotyped as “dangerous warmongers, savage and aggressive … with no sense of the value of human life … and without mercy towards their defeated enemies (Storer 40). Such fictional depictions were especially useful, then, as Germany once again became a wartime enemy of Canada’s. Painting Germans as monstrous villains with an insatiable thirst for power rendered Canadians’ rationality (e.g., in considering Canada’s geographic relation to Germany) subordinate to their emotions, with respect to invasion. 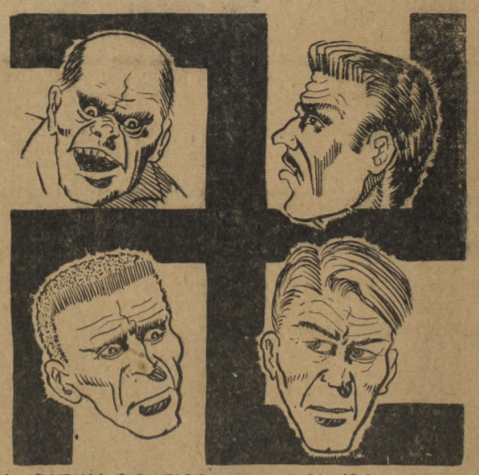 Situating these villains in Canada presented explicitly how the ruthless nature of Germans could propel them to conquer nations far beyond the European sphere – a terrifying prospect to these comics’ Canadian readership. Indeed, caricatures like these played a role in the justification for German internment camps that were introduced following the invocation of the War Measures Act in 1939 (Auger 101). The deployment of this fear-mongering propaganda served a broader purpose than just drumming up public support for the war effort – it intended to reorient Canadians’ entire perception of their country in relation to the rest of the world. Coinciding with increasing globalization and technological advancement (martial or otherwise), this propaganda sought to dispel any notion that Canada was detached from European affairs, as the isolationists argued. Not only did the war pose a threat to Canada’s freedom and security, but Canadians themselves thus had an obligation to assist their allies in fighting it, as if directly it concerned the homefront. One of the more difficult parts of beating back against Canadian isolationism was attempting to construct a distinct conception of patriotism, a concept appropriated by isolationists of the inter-war period to the extent that the two ideas were inextricably linked. Pro-war propagandists now had to ‘reclaim’ patriotism – to make the case that a new Canadian identity does not have to necessarily entail total detachment from the British Empire, and that true patriotism should be exhibited by performing one’s civic duties to his/her country, especially during times of war. These wartime civic duties, while more obvious and direct for Canadian adults (e.g., enlistment; increased motherly duties during husband’s absence; etc. ), were expected just as much from Canadian youth, in less direct and largely symbolic forms. However, youth-targeted propaganda as peddled in comic books like the Canadian Whites didn’t encourage civic responsibility by depicting such symbolic forms of participation, but rather promoted the concept of civic responsibility broadly through fantastical stories that would be much more engaging and persuasive for the reader. Fig. 2. Murray Karn. Frame from “Thunderfist.” Active Comics, no. 7, August 1942, p. 52. Bell Features Collection, Library and Archives Canada. Active Comics no. 7’s “Thunderfist” strip, another North-American-invasion story (this time American-oriented, however), utilizes its North-American setting not just to stoke fear, as the “Dixon of the Mounted” strip does, but to present civic participation in a familiar context more relatable to the Canadian reader – not in terms of content (in fact, it portrays a particularly outlandish example of civic participation) but geographically and culturally. The story follows an American reporter, Beverley Holmes, as she exposes a pair of Japanese spies in her city, and subsequently plays an active role in defending her country against a larger Japanese invasion. Importantly, this is not an affair that she stumbles upon, but rather, from the outset, it is a result of a deliberate initiative on her part to be mindful of foreign spies in her own country – “They look like Japs,” she notes upon seeing two Asian men sitting at a nearby table, and promptly confiscates one of their maps (Karn 52; Fig. 2). She is not simply a bystander assisting her country’s military indirectly; she actively initiates conflict with the foreign spies, and takes it upon herself to do anything in her means to thwart their plans. This reaches an extreme extent as Beverley’s decides to travel to the coast indicated as the point of invasion on the spies’ map to warn the Commanding Officer stationed there, which ultimately leads to her capture. Regardless of her personal safety, Beverley’s patriotic compulsion to defend her country remains unwavering. “I just had to go and see what was going on,” she explains after being saved, revealing that her actions were done out of obligation rather than preference (Karn 64). Here, Beverley, despite being American, is presented to the comics’ readership as the ideal Canadian patriot – selfless, brave, and actively engaged in her country’s war effort. Fig. 3. Sia R. Chilvers. 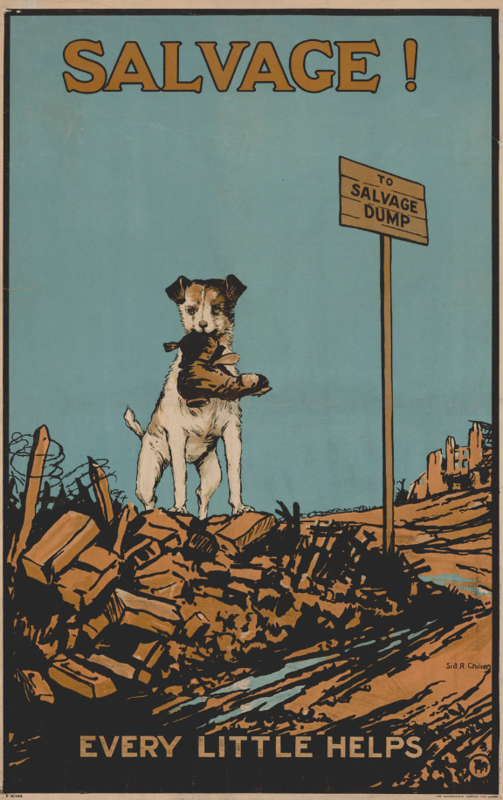 Propaganda poster: “Salvage! Every Little Helps.” 1914-1918. Library and Archives Canada. Fantastical stories like this were obviously not intended to convince Canadian children and adolescents to necessarily confront foreign spies or involve themselves in actual conflicts, but portraying civilians as doing so inseminated the broader concept of civic participation into youth culture; it normalized the idea that civilians have “duties to fulfil” in regard to the war effort, and that “everyone should be preparing for the war,” no matter one’s age or relation to the battlefield (Judy and Palmer, 75). How this was actually manifested by Canadian children in reality was much less direct and exciting, consisting of mostly symbolic and comparatively inconsequential methods – but, as a propaganda poster from the prior World War reads, “Every Little Helps” (Fig. 3). Many of these methods were related to self-rationing and fundraising, such as assisting with the cultivation of “victory gardens,” a practice that stretched back to the First World War and was intended to both free up railway space that could be used to ship goods en route to Europe, and amass proceeds through the sale of food that would be donated toward the war effort (Mosby 104; Martin and Petrowski 6). Similarly, children were encouraged to save up their allowance money and donate it to organizations involved in assisting with the war (Glassford 223). This message implicitly pervades civic participation-related propaganda of the period like “Thunderfist.” Whatever from this civic participation took, the material impact it had was of less importance than what it stood for: a commitment among Canada’s next generation to maintaining traditional notions of patriotism that entailed pro-war, internationalist attitudes. Considering the largely symbolic nature of the civic duties Canadian children undertook, there is reason to believe that those behind the propaganda found in Active Comics no. 7 (and other youth-targeted media of the time) were less interested in their readership’s immediate manifestations of patriotism than they were in the long-term implications of pro-war messages shaping them from a young age. In other words, what this propaganda effected was less important to its producers than what it prevented: isolationist thought corrupting impressionable young Canadians. Youth-targeted propaganda acted more or less as insurance, ensuring that the next generation of Canadians were not only willing but felt compelled to go to war once they came of age. In fact, one of the ways by which Canadian youth were told they could help their country’s military was by “keep[ing] themselves healthy, in order to be of use to their country now and in the future” – explicitly revealing that the government valued their potential as future servicemen and servicewomen above whatever contributions they were currently capable of providing to the war effort (Glassford 223). The technique of recontextualizing the Second World War in North-American contexts, then, was well suited for the fantastical, unrealistic elements that the comic medium entails. The comics examined in this essay could stretch the reality of how its readership would be engaging with the war because its producers were not at all concerned with such reality, but rather with the implications of it. These propagandists effectively utilized the generic conventions of the comic to convey broad ideas that concurrently were being inseminated in the culture of Canadian adults (e.g., xenophobia, anxiety, civic participation) in a highly mediated form that played well with the country’s children, sowing a culture of pro-war patriotism that would go on to unconsciously shape how they approached the war as adults. Auger, Martin F. Prisoners of the Home Front: German POWs and “Enemy Aliens” in Southern Quebec, 1940-46. UBC Press, 2005. Bothwell, Robert. “The Canadian Isolationist Tradition.” International Journal, vol. 54, no. 1, 1998, pp. 76–87. JSTOR, doi:10.2307/40203356. Chilvers, Sia R. Salvage! Every Little Helps Poster. 1918-1914. Library and Archives Canada, 1983-28-190. Glassford, Sarah. “Practical Patriotism: How the Canadian Junior Red Cross and Its Child Members Met the Challenge of the Second World War.” The Journal of the History of Childhood and Youth, vol. 7, no. 2, May 2014, pp. 219–42. Project MUSE, doi:10.1353/hcy.2014.0024. Goodnow, Trischa, and James J. Kimble, editors. The 10 Cent War: Comic Books, Propaganda, and World War II. University Press of Mississippi, 2016. “International: Canada Nixes ‘All Quiet’ But Okays ‘Nazi Spy.’” Variety (Archive: 1905-2000). Los Angeles, vol. 136, no. 1, Sept. 1939, p. 6. Martin, Andrea, and Tyyne Petrowski. “‘Are You “Doing Your Bit”?’: Edith Robertson, Letter-Writing, and Women’s Contributions in First-World-War Winnipeg.” Manitoba History; Winnipeg, no. 82, Fall 2016, pp. 4–11. Mosby, Ian. Food Will Win the War: The Politics, Culture, and Science of Food on Canada’s Home Front. UBC Press, 2014. Spruce, James. “Two Solitudes Lost: Comparing and Contrasting Interwar American and Canadian Isolationisms.” American Review of Canadian Studies, vol. 48, no. 1, 2018, pp. 1–19. Scholars Portal Journals, doi:10.1080/02722011.2018.1428206. Stacey, C. P. Canada and the Age of Conflict: A History of Canadian External Policies. Macmillan of Canada, 1977. Storer, Colin. “’The German of Caricature, the Real German, the Fellow We Were up against’: German Stereotypes in John Buchan’s Greenmantle.” Journal of European Studies, vol. 39, no. 1, Mar. 2009, pp. 36–57. Crossref, doi:10.1177/0047244108100806. American comics were popular during WW2, and the Canadian youth immensely enjoyed reading them. However, the Canadian Whites, “due to the black and white interiors that distinguished them from the four-color American comics of the period, arose in response to the wartime importation ban on non- essential goods that removed American comic books from Canadian newsstands” (Beaty 429). These comics were used an entertainment medium for young readers, and influenced the role of youth during the war. Political messages were spread in newsletters and narratives of these comics to direct the readers into being faithful towards their country. In Active Comics no.5, the repeating theme of loyalty portrayed by Active Jim and other narratives, portrays the political aspects of the comics during the war, and how these messages were ultimately used to instill the Canadian identity into both the male and female readers. These comics advertise allegiance in their narratives, while also challenging the political issues of the war. The Canadian Whites were not just a medium for entertainment. They included a variety of themes in their stories to influence the readers. Active Comics no. 5 (May 1943) is filled with stories about different superheroes who fight evil and represent the Canadian identity through their actions. In fact, Active Jim, “an athletic and clean-cut young man who serves as the spokesman and figurehead of the Club and who, from this issue on, merits a regular story in Active Comics until issue 24” is the voice of a Canadian youth during the war who advertises loyalty and how vital it is to be allegiant (Kocmarek 157). 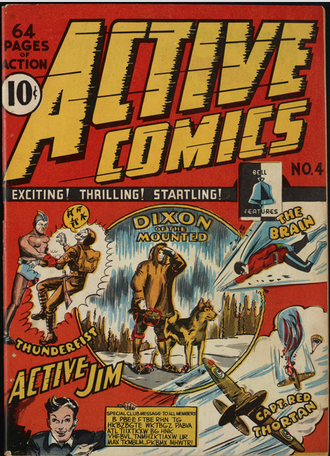 By using a character such as Active Jim, the writers not only made these comics interesting, but they also effectively included themes of loyalty which influenced patriotism to the children and adolescents who read these comic books. Comics. Dixon of the Mounted. No.5, May 1942, Bell Features Collection, Library and Archives Canada. finds out the sheriff of the town is helping the villain of the story get away with his crimes. Similarly, in the story “The Brain,” the mayor of the city deceives everyone into thinking that he is helping the hero of the story, The Brain, save the city from Dr. Black who is a corrupted villain. However, The Brain is able to outsmart the mayor, and reveals that he was in fact Dr. Black. Aside from having racial intentions in naming a villain “Black,” which is interpreted as people of colour being evil, both of these short narratives were written to portray the themes of not only good versus evil, but also the theme of loyalty. In both stories, the villains were of high authority (sheriff and mayor) and are both breaking the law. In this way, the writers of the comics were able to show how being disloyal is being evil and it leads to not succeeding. Although the theme of loyalty is covert here, it is obvious that the plot of these stories had a message behind them and were done deliberately. To glorify loyalty and patriotism, Active Jim is a utility used by the writers of the comics to remind the audience of their duty towards their country. In fact, “Active Jim’s Monthly Message” does the same job as those two narratives. As mentioned before, in this monthly message, Active Jim praises loyalty and explains the importance of being loyal towards the “king and country” (Active Comics no. 17). This section of the comic is dedicated to a whole message about why allegiance is important. With the corrupted characters losing in every story, and the theme of loyalty and its benefits being spread in the comic, it is evident that that the repetition of this theme is vital because it is glorifying loyalty and denouncing corruptness. Loyalty was taken seriously when it came to the Second World War. The pressure of war forced governments to do as much as they could to minimize any betrayal of loyalty. In fact, they praised loyalty through propaganda and newspapers. For example, in “French-Canadian Loyalty Demonstrated at Montreal,” a newspaper article from April 14th 1942, it is mentioned that “loyalty is, and always has been, one of the greatest qualities of French-Canadians” (“French-Canadian Loyalty Demonstrated at Montreal”). This praising of allegiance illustrates how much loyalty was important to Canada, and how conveying themes of loyalty in comics was not out of the ordinary and in fact, done deliberately. L, Bachle. Panel from “The Brain”Active Comics, No. 5, May 1942, p. 18. Bell Features Collection, Library and Archives Canada. British flag on it. The hat is significant because the artists of the comics were pointing fingers at the people in authority who ran the government (Dr. Black does after all end up being the mayor) and questioning their faithfulness towards their country. Similarly, in “Dixon of the Mounted,” it is the sheriff who is corrupted, even though it could have been anyone else in the story. Also, the sheriff being corrupt is only mentioned towards the end of the story, and they did not put much focus on that part; the writers did not challenge these norms by being blatantly obvious. This is vital because it shows how furtive the writers must have been to share their own unpopular and unwanted (by the government) opinion. This could have been because they knew what the government wanted the audience to take away from the comics, and that was to become more loyal towards their country instead of questioning if the government is corrupt or not. These issues of corruption are ways in which the writers broke thorough norms and challenged authority, while also pushing allegiance towards the readers. By doing this, the authors were able to express their own ideas through small details in the comics, while also being able to help the readers become more attached to their country and perhaps join the war for their country, since that is what their childhood heroes (the superheroes) have advertised in the comics they read. It is clear that these comics were used to push messages of loyalty to the readers and influence their ways of living during the war. However, it is vital to understand who these audiences were, and why they would be influenced by these comics. The comics “were read eagerly by the adolescents and pre-adolescents of Second World War” (Kockmarek 156). “During World War II, Canadian comics were the only option for comic book readers, [and these comics were] different from their American counterparts in their scope as well as their levels of violence and patriotism” (Reyns 15). The Canadian Whites being the only accessible comic, forced the readers to read these comics and also helped the messages these comics contained reach all the comic book fans, which were “both boys and girls” (J.L. Granatstein and F.Oliver). Knowing that both male and females read the comics, it is certain that Active Jim’s monthly message to stay loyal during the war was therefore for both the male and the female audience. It is easy to assume women did not have a role in the army, and therefore that his message most likely was not directed to the female audience of the comics. However, this is entirely false. Women were active in the war effort just as much as men, and they had many responsibilities such as “street car drivers to aircraft designers – and 1.4 million women were employed, a participation rate of almost one in three, at the wartime peak in 1945” (J.L. Granatstein and F.oliver). Understanding the role of women in connection to the comics is significant since that means the political messages of loyalty were just as much directed towards the female readers as the male readers. The superheroes are the characters who express loyalty towards Canada, and the evil villains are the ones described as “crooks” (Active Comics no. 5 11). The children who read these comics praised these heroes and wanted to be like them. This is why all the superheroes are men who are loyal to their countries. According to Beaty, the superheroes in these comics represent the Canadian identity (Beaty 431). With this being said, the superheroes were “not just entertaining fantasy figures” (Beaty 431), and indeed they played a much higher role. The roles of heroes such as The Brain were to show what a good soldier is like and how important it is to not lose your self identity. However, having superheroes who have powers was not very productive in influencing the readers. Therefore, the comics that “were often doled out by teenage creators only a little older than” the readers themselves” (Kocmarek 157), used characters like Active Jim to leave more room for the readers to relate to the comics. Active Jim did not have any powers and was an ordinary teenager during the war. He was the perfect example of a hero who was “exciting, but not overly exciting; active in the war, but not so active as to accomplish much of significance” (Beaty 430). Including relatable characters was done deliberately to help the readers connect to the characters more which ultimately helps the influence of the heroes become much higher; if the heroes did something completely unimaginable for the readers, the young readers would not be able to put themselves in the position of the hero and therefore not relate to the Canadian identity. The Canadian Whites have been part of the Canadian culture since the Second World War and have been a great medium to influence the children of war. These comic books were not only used as entertainment in a time of war, where Canada was having difficulties with American goods; they were also used to influence the young readers to become more patriotic towards their home country. The political messages of allegiance spread by the narratives such as “The Brain” and “Dixon of The Mounted,” as well as “Active Jim’s monthly messages,” all contributed in helping the comic writers shape the Canadian identity and influence readers to not betray their own country and even join the war to support their leaders and families. 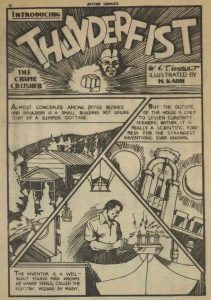 The Canadian Whites were World War II-era comic books published and written in Canada that featured coloured front and back covers and a black and white interior. These comics came to be due to the War Exchange Conservation Act which restricted the importation of non-essential goods from the United States into Canada and this included comic books. There were four companies that came to be during this time period and took advantage of the demand for an emergence of Canadian heroes that would offer civilians comfort and hope. One of the most popular companies being Bell Features, the Canadian comic book scene grew and prospered during this time period giving Canadians a real image of what their heroes overseas looked and acted like. This industry was created as “…an entrepreneurial venture built from Canada’s war time economic situation and its political response to that situation…” (Kocmarek). This was the one chance for Canada’s comic book scene to be built and thrive. In Active Comics no. 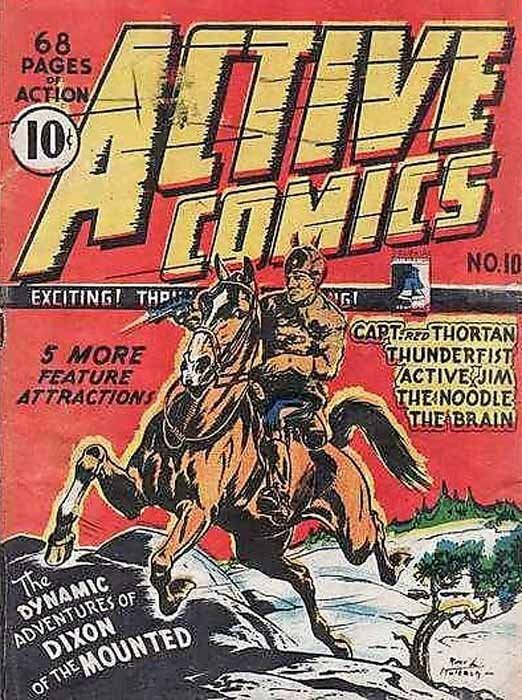 10 there are heroes of all kinds depicted in the 68 page, 10 cent comic including “Dixon of the Mounted”, “The Brain”, “Captain Red Thorton”, “Active Jim”, and “The Noodle”. These heroes are all diverse individuals in their own right but seem to have significant overlaps in terms of what makes them heroes in Canada. “For a brief six-year window, and for the first time, we had comics that we could call our own. These Bell Features books, along with the other WECA books (from Anglo-American Publications, Maple Leaf Publishers, and Educational Projects) were as Canadian as comic books ever get, and they laid the foundation for any future comic book that wanted to earn the designation ‘Canadian'” (Kocmarek). For young Canadian soldiers during World War II, masculinity was something that was both learned from their elders but also ever-changing in definition based on what the civilians of Canada needed them to be. 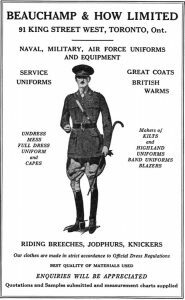 Soldiers were often depicted in posters and wartime advertisements as well put together, tall and slim men with shiny boots and a stern face often with some sort of facial hair. The following photo suggests “…how war would reassert an officers masculine image and bearing” (Goodlet and Hayes). Young soldiers not only had to look the part to be considered masculine but they also had to act in an obedient, disciplined manner which was taught to them by their superiors. These men were taught to lead very simple lives with little to no entertainment and “Officers were permitted to have fun, but within bounds” (Goodlet and Hayes). Overall, the image of a masculine soldier who could be looked up to as a Canadian hero was stern, serious, well put together and well disciplined. During World War II, Canadian solders were seen as “man-gods” (Beaty) which is how the idea of a Canadian Superhero came to be. All these heroes have one interesting thing in common: they have no superhuman power. Their job was to be “…exciting, but not overly exciting; active in the war, but not so active as to accomplish much of significance” (Beaty). All in all, the main goal was to give Canadians heroes that they felt they could connect to as people which is why they didn’t seem unreal and the ideas in each comic were not unimaginable in real life context. “Dixon of The Mounted” could be your neighbourhood police officer, while the brain could be the businessman who lives in your apartment building. Being a Canadian hero meant to be distinctly un-American while also being humble and able to fit into typical Canadian society. In the first section “The Dynamic Adventures of Dixon of The Mounted” (Figure 2) (pp 1-9) we are shown a hero who is known for his patriotism and manly pride. Dixon’s super power is simple and functions perfectly with this story line: he is a Canadian Mounted Police trying to find out who is selling marijuana to “Indians and half breeds” (p1). He is pictured in typical mounted police uniform with a stern look on his face. In the next comic titled “The Brain” (pp 10-18) our superhero is younger than the previously pictured Dixon and he is shown wearing “typical” superhero garments: a mask, tights, a cape and boots. The Brain is what one may picture when thinking of the word “superhero” and his purpose is completely different from that of Dixon. He is saving a “damsel in distress” from what looks like alien captors. Similar to Dixon, The Brain does not have any super-human powers. The Brain is simply strong, fast and masculine. He is an example of a stereotypical “macho-man”. Next, we have the story of “Captain Red Thorton” (pp 26-34) whose superpower is once again being manly, patriotic and defeating a Canadian enemy of this time: the Japanese people. He is pictured with a muscular build, slicked back hair and nothing but a gun strapped to his hips as protection. We then have “Active Jim” (pp 36-38) who is shown saving a young woman from another Canadian enemy: the Nazis. This story serves as encouragement for young men and woman to serve their army as it says “Like all you Canadian boys and girls, Jim has solemnly pledged his services to eventual allied victory…” (p26). Lastly, we have “The Noodle” (pp 39-42) who is animated completely differently from the rest of our heroes as he resembles a baby. His mission is to save the world from “the jeeter-bug” and similar to our other heroes, he is saving a woman. All these comics have a common enemy as to ensure that the Canadians enjoying the comics make an enemy of the Japanese people, Nazis, drug dealers and anyone who is not of “good moral standing”. Figure 2, Rene Kulbach, Front Cover Active Comics no. 10, November 1943, Bell Features Collection, Library and Archives Canada. Canadian Comics during World War II were so much more than a medium for entertainment. They were a connection to the outside world that Canadian people, children especially, had never had the chance to experience and “…a didactic vehicle, a means to popularize certain philosophical and religious ideals” (Bell). During World War II, Canadian comics were the only option for comic book readers. “These comics were different from their American counterparts in their scope as well as their levels of violence and patriotism” (Reyns-Chikuma and de Vos). Though Canadian heroes did not have superhuman powers per say, their powers were an uncanny sense of masculinity, patriotism, and religious morals. These comics were a mirror of everything a good Canadian citizen would be during the war and that one could be just as helpful and important on the Homefront as on the battlefield. Some ways Canadians on the Homefront helped out were victory gardens, or children collecting war stamps; young or old everyone did their part. “These comics solicited readers’ opinions about what was and should be inside them and offered up contests for those same readers to participate in with almost every issue” (Kocmarek). The purpose of these comics were “…to produce exciting adventures designed to intstill patriotism in Canadian kids” and also to “…explore complex mystical beliefs and the nature of good and evil” (Bell). These qualities are what separated Canadian Comics from the rest of the world and what made them so special. They were unapologetically Canadian and distinctly un-American. Figure 3, Rene Kulbach, Back Cover Active Comics no. 10, November 1943, Bell Features Collection, Library and Archives Canada. artistic interpretations of Canadian identity” (Reyns-Chikuma and de Vos). Unfortunately, “…the next generation of Canadian kids thrilled to the adventures of foreign heroes” (Bell). Thus, Superman, Spiderman and all the popular American comics reemerged. Though many Canadian artists have been persistent in the Canadian Comic book scene in trying to ensure its success, other Canadian artists view superheroes in comics “…represent cultural immaturity” (Bell) and “…an artistic deadend” (Bell). It is possible that superheroes simply do not represent Canadian history and culture and that we need a comic medium that includes “…literature, autobiography, history, and other sources” (Bell). because “…Canadians are probably way too wary of the uncritical portrayal of unrestrained heroism and power for the superhero genre to ever become a mainstay of the country’s indigenous comic art” (Bell). Though the intense popularity that Canadian Comics experienced has ended, “…the dream of a national superhero is likely to persist as long as Canadians produce comic art” (Bell). Bell, John. Invaders from the North. Dundurn, 2011. Fig. 1. Active Comics. No. 4, May 1942. Bell Features Collection, Library and Archives Canada. In Active Comics No. 4 from May 1942, there are not only an arrange of heroes that intrigued young children from this era, but there are enemies that these heroes fight that also engage readers to continue reading about their favourite heroes. These enemies are the main reason why heroes like “The Brain” or “Capt. Red Thorton” have a purpose. The enemies portrayed in this comic are not all centred around war enemies that the Canadian army had during the second World War such as the Japanese or German. These enemies stand out in particular due to the way they complement each other, leading to the success of the heroes at the end and the enemies ultimate defeat. Through analyzing each comic heroes in the comic number from “Dixon of the Mounted” to “Thunderfist”, it is evident that these heroes do not have the same extravagant powers that deem them able to defeat any enemy. Each enemy for the hero is created to fit what the hero is able to do ability wise, so that the inevitable end of the comic would be the hero winning. The enemies within these comic books are the important factor in the evolution of these heroes because without them, these heroes would not be the heroes’ children of the 1940’s looked up to in a time of despair. If not for the enemies within each comic that were specifically designed to fit the heroes’ capabilities, the heroes would not only be subject to not having much enemies, but to also face enemies that they cannot handle. Through this strategic design to have the enemies centred around the comic heroes’ skills, the outcome is creating a world for children of the second world war to escape to knowing that their favourite heroes are able to defeat the enemy quickly. The first comic series of the comic number focuses around “Dixon of the Mounted” trying to actively solve the case of the disappearance of his friend, Constable Wicks, but he is soon ambushed by an enemy that is hidden out of his site. This enemy is sent by a sheriff that is helping an enemy get away with a crime that they are scheming and getting rid of Dixon is on their plan list to be able to achieve their goal. Dixon is the hero in this comic series due to the fact that constable Wick had died in the process of uncovering the enemy that Dixon is after. Since constable Wick was facing an enemy that was greater than what his capabilities were, which is unknown in this comic number, he fails to defeat them and dying from his attempt. Dixon is put on the job to not only seek vengeance on behalf of his friend, but to put his skills into use. His capabilities are made to be better since he is the hero of the comic, hence why the enemies are drawn to him. These enemies are designed for Dixon because if anyone could defeat them than constable Wick would have been able to as much as Dixon is considering they are both men in the law enforcement. It is evident on page 6 of “Dixon of The Mounted” that Dixon has skills in quick thinking, strength and agility that the enemy lacks due to them always attacking and scheming from afar. With the enemy being distant from their target, it is a perfect opportunity for the hero, Dixon, to counter their cowardly attempts by doing the opposite: hunt them outright. Even with enemies being sneaky in their ways of getting over the law enforcement by strategic planning, a law enforcement dominated by one hero allows there to be enough security within the region. The enemy is consisted of a sheriff that is familiar with how the system works and has criminals join him in his pursuits of defeating Dixon, who they cannot defeat. Dixon could be imagined as being a counterterrorist strategy to help the enemy stay away from Canada by using the skills he embodies to defeat them (Chalk 15). Elaborating on this, Dixon is Canada’s most skilled mounty that can defeat even the worst criminals that have entered Canadian territory. These precautions are usually taken by an army or complete law force, but the enemies that they are facing are a greater issue since they have a sheriff helping them achieve their goal of sabotaging Canada. The enemies that Dixon faces are his perfect match due to him being able to be Canada’s sustainable counterstrategy that has the ability to face an underhanded enemy. If these enemies were forward and came in a larger number, Dixon would fail to achieve defeating them since he is only one, ordinary Mounty. Opposite of a comic of a semi realistic storyline, “The Brain” is a comic that focuses around the supernatural, meaning that the enemies are not human. The enemy he is facing is a mummy and a ghost that have come alive to defeat him. The Brains’ expertise as a hero is to defeat creatures and monsters that have come to Canada to overtake it. These enemies are designed for the Brain since he is able to connect with the supernatural world unlike any other heroes within the comic book number. Also unlike the other heroes in this comic number, the Brain has the power to fly, meaning that he possesses otherworldly powers that makes him a stand out hero. By having these ability, it is easier for him to fight the mummy that is after him and ultimately being able to defeat him for good. The enemy that he is faced with is stronger and otherworldly than regular human enemies, making him a hero with a unique capability, but having harder enemies to defeat. The mummy is a complex enemy to have due to the notion that the Brain would have an easy time defeating it since such creature would be very fragile from years of decomposition, but the twist of this concept is that the mummy is an ordinary man with powers. The mummy is made to be an equal match against the Brain because they both possess similar characteristics of being men with powers. By having these similarities, it is easy for the Brain to use this to his advantage since defeating the mummy only takes minimal effort if they are compatible ability wise through their common grounds. The ghost enemy is even more complex due to the fact that there is no body meaning that he is left to fight a spirit. Surprisingly, the mummy and the ghost are a match for the Brain when it comes to strength and strategy, something that the Brain was not expecting. On page 24 and 23, it is shown that the Brain is able to defeat such supernatural beings without any real harm done to himself. Leo Bachle. 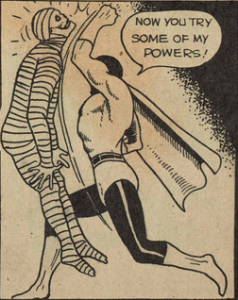 Panel from “The Brain: The Return of the Mummy Man.” Active Comics, No. 4, May 1942, Commercial Signs of Canada, p. 23. Bell Features Collection, Library and Archives Canada. Within Active Comics No. 4, the enemy is undermined by the hero of their respected comic series, but the enemy is much more valuable than they are perceived. Even though these enemies are causing destruction among society, it leads to comic heroes to be able to be the heroes that they are. Without enemies to cause mayhem within a heroes’ city or country, a hero cannot be the hero that they are. A hero is only a hero when they do something that protects others from evil within their living spaces. Such evil can consist of robbing a bank, murdering someone or even trying to sabotage a city. 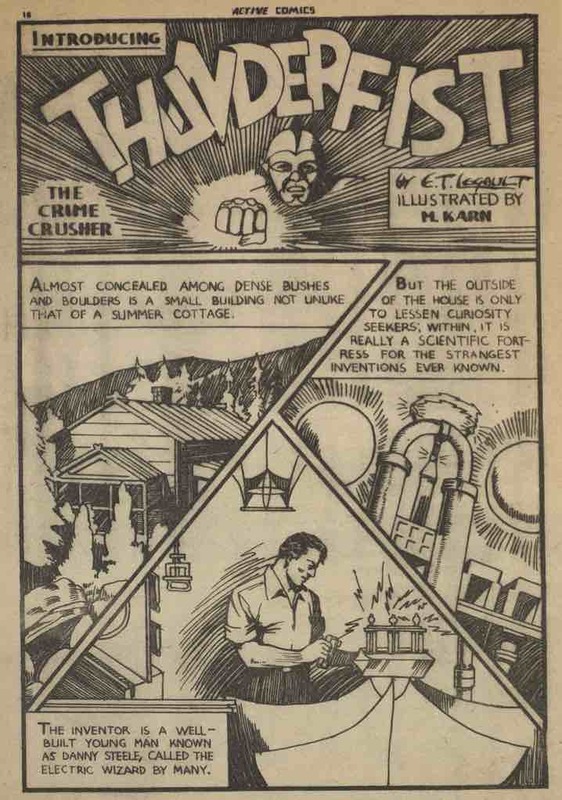 The comic series entitled Crime Does Not Pay, one of the first true crime based comics, plays on the idea of the enemy having a purpose within a larger picture: being the reason there are heroes who want to put an end to crime. Going off of this concept, this comic focuses on the criminal and the crimes that they have committed, which drives the series. In Chris and Rafiel York’s book, Comic Books and the Cold War, 1946-1962, they discuss how this comic series glorified the enemy to the point where readers were left to wander whether they should be intrigued by the crimes that these criminals have committed or be scared of them (York 160). This crime centric comic book evolved the way readers viewed criminals and enemies within comic series because they were interesting to read about. This curiosity of what kind of crimes criminals can commit and all the chaotic behaviour they embodied allowed readers to crave more of the exciting lives that these law breaking people lived. Even with these comics depicting graphics that were questionable for the age group reading, it did intrigue a well needed focus on characters that were not the hero. This was needed because the hero of a comic such as Dixon from “Dixon of the Mounted” only depicts the good that a hero has to bring. By following storylines that focus on the enemy brings in the other side of the spectrum as to why heroes are needed to protect their city or country from criminals. With this comics’ concept of focusing on the enemy, enemies of sorts have gotten interesting storylines that compel readers to be interested in them as well as the hero. The enemy having a back story or a plot that gives some information as to why their favourite hero is trying to defeat them causes readers to have a stronger connection to the comic. With this in mind, Active Comics No. 4 channels this concept of bringing some attention to how the hero and the enemy have to be on par to bring interest to the comic. Without having an interesting hero or enemy, the comic has no way of bringing any substance to a reader. The dependence of a hero on their enemy counterpart is more crucial than it may seem when thinking about a comic. The heroes of the Active Comic No. 4 are depicted on the front cover to display who the readers, mostly children, should be interested in to intrigue their interest. This all changes while they are reading the context of the comic and getting to know characters outside of the hero, which are most likely their enemy. In Nickie D. Phillips and Staci Strobl’s book Comic Book Crime, they acknowledge that the hero and enemy of the comic are like “yin and yang” since they need each other to function (Phillips and Strobl, 82). This is true when thinking about a comic hero without an enemy counterpart to defeat and an enemy without a hero counterpart to try to defeat. This back and forth of trying to claim power over the other is the driving force of comics and what readers stay for. Both characters drive one another to great lengths to continue a plot line that is stimulating and has a purpose, not just a plot that lasts only one comic. In Active Comics No. 4, the it is evident that the enemy plays a bigger part in a comic series than it may seem from the cover. A hero is nothing without an enemy counterpart who is a match for them ability wise, enough to be an interesting duo that children or young adolescence would be thrilled to read about. Through being each other’s back bone in a comic series, the heroes and enemies in this comic number grants that there will be well played out plot and storylines to follow along for both characters. Chalk, Peter and William Rosenau. Confronting the “Enemy Within”: Security Intelligence, the Police, and Counterterrorism in Four Democracies. Santa Monica, CA: RAND Corporation, 2004. https://www.rand.org/pubs/monographs/MG100.html. Phillips, Nickie D., and Staci Strobl. Comic Book Crime, edited by Nickie D. Phillips, and Staci Strobl, NYU Press, 2013. pp. 82. ProQuest Ebook Central, http://ebookcentral.proquest.com/lib/ryerson/detail.action?docID=1225007. York, Chris, and Rafiel York. Comic Books and the Cold War, 19461962, edited by Chris York, and Rafiel York, McFarland & Company, Inc., Publishers, 2012. pp. 160. ProQuest Ebook Central, http://ebookcentral.proquest.com/lib/ryerson/detail.action?docID=867075. Fig1. Active Comics. No. 15, February 1942, Commercial Signs of Canada: Cover. Bell Features Collection, Library, and Archives Canada. Bravery, heroism, and patriotism are some of the themes found in the Canadian Whites comic books. These themes found in comics for children were also found in the war itself. Specifically, in number 15 of the Active comics (January 1944) series, one can see these themes being portrayed and projected on to the readers (children). The influence of the great war on children was greatly underestimated. However, adults, older brothers, and uncles had started to disappear from the lives of these children when the war started and these children were just as much involved (Cook). This exhibit looks at the use of comics and their demand as a platform for grooming children in the 1940’s. These comic books were not for the sole purpose of grooming children to support the war but a lot of the stories and advertisements within the comics represent the war and patriotism to Canada. The stories in this comic book usually end happily when the heroes defeat the “enemies”, teaching children that safety, victory, and happiness can be achieved from helping with and winning the war in whatever ways possible. 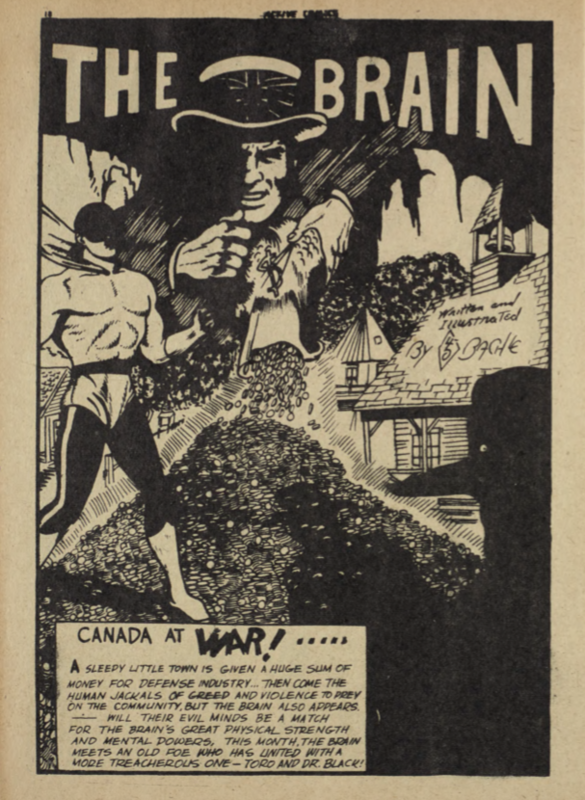 The Canadian Whites are a series of comic books made on white paper with black ink during the second World War. Canada was unable to purchase non-essential goods and comics were one of those goods. Canadian children needed something to do/enjoy and the popular American colored comics were not available. Since this was the case, Canadian authors and illustrators including Adrian Dingle, Frank Keith, Leo Bachle, Kurly Lipas, Harry Brunt, Paterson, Al Cooper, and Jon Darian contributed to Canadian Comics which were called the Canadian Whites and were for the benefit and entertainment of children. These comic books consist of continuing series as well as intermittent stories that take up one or more pages. The stories are told in boxes mostly through drawings and a few words called sequential art. The comic books also include advertisements for readers to buy other Canadian comics, war stamps, toys, and notices/challenges for members. 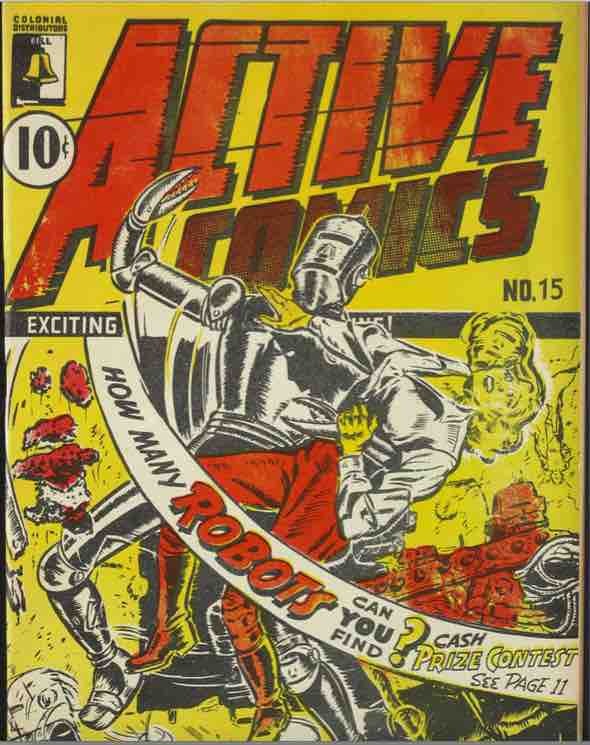 The comic book specifically being discussed in this exhibit is number 15 from the Active comics (January 1944) series. 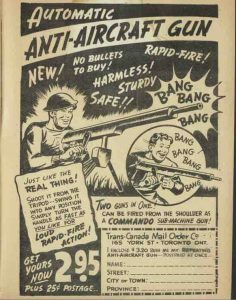 In this comic book, the representation of guns is prominent as it is portrayed as an asset in a few of the stories and it has a full-page advertisement for a toy anti-aircraft gun as well. Adults were disappearing from children’s’ lives after the war began expecting them to help around the house, working for money, and purchasing war stamps (Cook). One of their primary sources of entertainment and one of the few activities for children was reading comics. At that time, war toys were becoming normalized (Fisher) and one of the ways this was possible was through advertising them in comic books and portraying gun users as the ones who succeed in the comics. These comics showed children who their enemies are by showing them Canadian heroes fighting people of the enemy countries. Children who were from the enemy countries were bullied once the children learned who Canada was fighting in the war, as explained by Galway “Canadians of German or Italian descent were not allowed to participate in war efforts, were teased, taunted, or assaulted” (Galway).By closely examining the stories and images, contrary to what I expected there is only one story that has the hero handling a gun. “Active Jim” is the only story that shows a hero using a gun while every other story that contains guns has them in the hands of the enemies. In “Active Jim” the police officer is handling the gun to stop a driver while “Dixon of the Mounted”, “King Fury and the Robot Menace”, “Capt. Red Thortan” and “The Brain” have the heroes fighting with their fists, knives, or swords. The representation of guns in the comics were being used to groom the kids to want to be soldiers especially considering that the only advertisement directed to children in this comic book is for a gun. The advertisement itself has an image of a soldier with a gun above the image of a child with a gun. Children tend to do what they see and if they are seeing an image of a soldier alongside a child with a gun they will want to imitate the soldier first of all and then, of course, the image of the child. 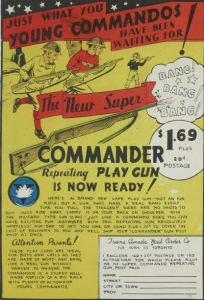 The representation of guns seen through the comic strips and advertisement is just one of the ways in which toy guns were being normalized for children in the twentieth century. The fact that guns were being produced in a mass amount that was benefiting the economy gave more reason for encouraging children to buy and play with them. The results of gun use being normalized for the war was not very smart as weapon use was not enforced well enough (Brown). Weapons were being misused and there were little to no laws on mishandling them. The laws that were placed were broken and were not enforced (Brown). Guns were becoming a danger to Canadians but were still being encouraged for the sole purpose of the children growing up to fight and prosper in the war. “Active Jim” is the only story that shows a hero using a gun. On pages 33-35 in the 15th edition of the Active comics the story of “Active Jim” and his assistant encounter a sanding crew mishap. Jim and a police officer use a gun to take down the driver who is sprinkling fine glass instead of sand. In this story, the reader is being taught that using a gun can lead to victory and justice. On the other hand, there are multiple stories with the enemies handling guns like in “Dixon of the Mounted” by R.L. Kulbach on pages 1-7 of the Active comics. In this story, the Japanese officers attack and capture Dixon using their guns to keep him from escaping. 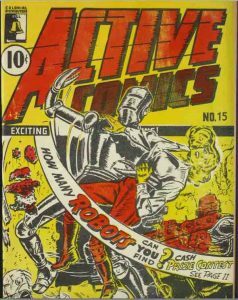 Another example is “King Fury and the Robot Menace” by Kurly Lipas on pages 22-28 of the Active comics. In this story, a doctor builds a robot and the Germans successfully steal it with the use of their guns. These stories not only show the obedience and power a person with a gun can have but also teach the readers about Canada’s enemies. 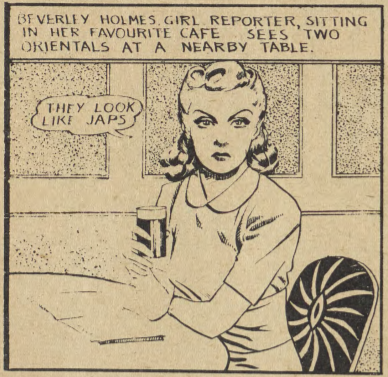 The enemies in this comic book are clearly shown to be of a different racial background through their facial features and butchered English dialogue. They were illustrated to portray the people Canada was at war against. This showed readers who their enemies were since they were also from Canada and in order to show patriotism to Canada, they were made to believe in having the same enemies as their country. The children of war were taught who their enemies were and how to treat them from such a young age. They were being groomed to make these people their enemies and dislike them through the beliefs of their country without their own intellect. In the same way, these kids were learning to romanticize the acceptance of self-sacrificing death as a price of heroism for their country (McKenzie). War was becoming their way of life. Anti-Aircraft Gun advertisement. January 1944, Toronto, Ontario: Bell Features and Publishing Company Limited. Special Collections, Library and Archives Canada. Apart from stories in this comic book, there is also an advertisement that strikes as utterly surprising. 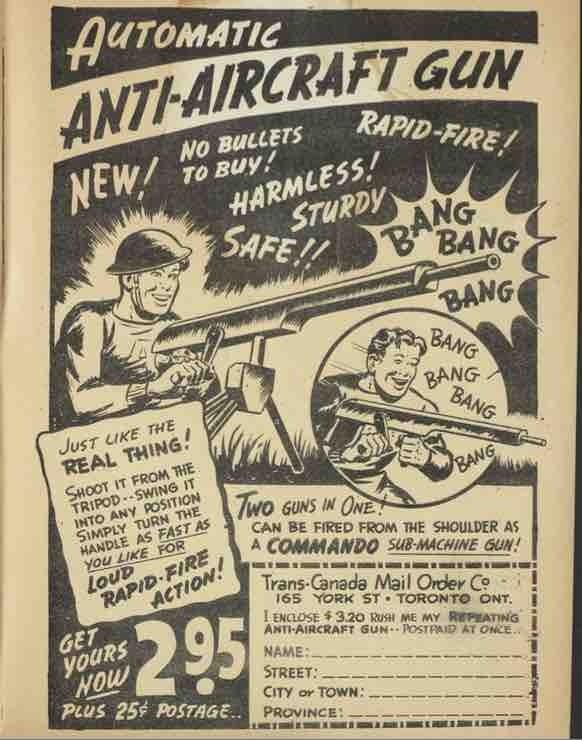 The advertisement is for an automatic anti-aircraft toy gun for children. It is so bluntly placed on the entire back cover (recto and verso) of the comics book. As a reader, it takes one by surprise that such a violent toy would be advertised to children. The way it is advertised is quite disturbing as well because it has an image of a soldier holding and aiming a gun similar to the toy one while there is an image of a child right underneath playing with a toy gun that looks like the one the soldier is holding. Some of the words used to capture the child’s attention are ” JUST LIKE THE REAL THING! SHOOT IT FROM THE TRIPOD, SWING IT INTO ANY POSITION SIMPLY TURN THE HANDLE AS FAST AS YOU LIKE FOR LOUD RAPID FIRE ACTION!” This advertisement is a great example of how guns were being normalized for children in such a blunt way, grooming them for war at the time they are the most vulnerable, their leisure time. These themes of heroism, bravery, and patriotism can be seen in the comics and everything else surrounding the children of the war. In number 15 of the Active comics (January 1944) series one can clearly see the representation of guns as a primary war weapon as well as the enemies of Canada that the children soon learn to accept as their own enemies. Comics were used as a platform to groom children into accepting and wanting to fight for Canada. They used the love of comics and mixed in patriotism to Canada, Canada’s enemies, and guns. All this by capturing the children’s attention while teaching them who to like, how to behave, and to work for the war. Cook, Tim. “Canadian Children and the Second World War.” The Canadian Encyclopedia. N.p., 04 Dec. 2016. Web. 09 Feb. 2017. Fisher, Susan R. Boys and girls in no man’s land: English-Canadian children and the First World War. Toronto u.a. : U of Toronto Press, 2011. Print. Mckenzie, Andrea. “The Children’s Crusade: American Children Writing War.” The Lion and the Unicorn (2007): 87-102. Web. 4 Mar. 2017. C.T. Legault (a). Active Comics. No. 1, February 1942, Commercial Signs of Canada: Cover. Bell Features Collection, Library and Archives Canada. Comic books became an important source for providing information and education for children about the World War. Active comics were used to display adventure through war stories and demonstrating to children about Canadian identity through superheroes. The period of Canadian superheroes started around the 1940’s releasing the “Canadian Whites”. According to Beaty, “These comics, so-called due to the black and white interiors that distinguished them from the four-color American comics of the period, arose in response to the wartime importation ban on non- essential goods that removed American comic books from Canadian newsstands” (Beaty 429). Active comic #1 has carried out a way to demonstrate children about war in a way where they are separated from reality, thus still being taught war in a much more fun approach. 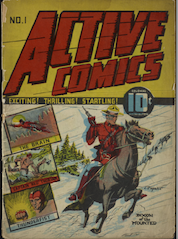 This exhibit’s critical aim is that the superheroes in Active Comics Issue #1 (February, 1942) like Dixon of the Mounted and Thunderfist explore the depictions that show children about Canadian society and values. In particular the masculine role that these two superheroes perform in order to demonstrate that all Canadian soldiers were brave and strong. The comics have never been as effective, as advertising, but the ideology of maintenance for Canadian military is still there. However, as long as they are considered a ‘children‘s book’ the comic book will serve as an active way of teaching them. C.T. Legault (a). 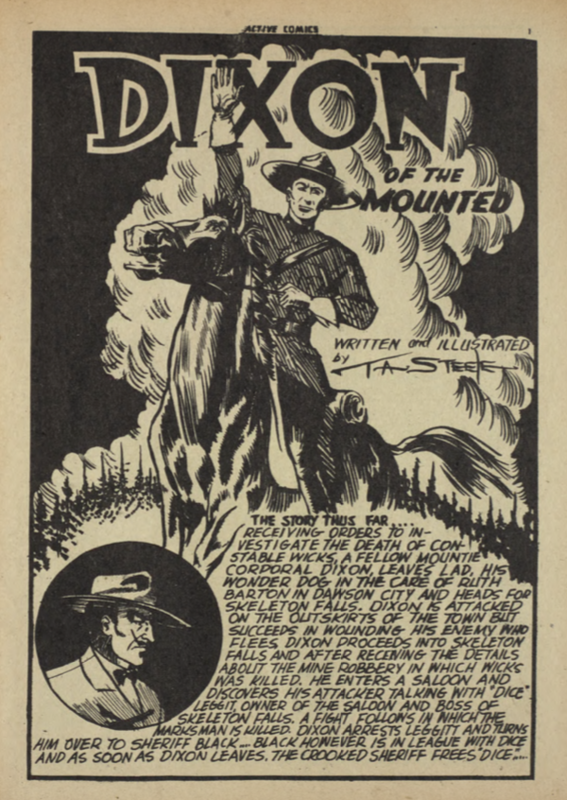 Front Cover Verso of “Dixon of the Mounted”Active Comics. No. 1, February 1942, Commercial Signs of Canada: Cover. Bell Features Collection, Library and Archives Canada. Active Comics was served to explain the importance of strong and intelligent superheroes to illustrate what it means to be Canadian. These comics portrayed all sorts of action and fun stories in order to catch the children’s engagement and the conformity on the battlefield. Moreover, the two superheroes Dixon of the Mounted and Thunderfist’s goal was not only to defeat the enemy, thus to engage children that these superheroes were strong Canadian figures. These two superheroes summon into question the theme between connecting popular culture and nationalism about Canadian-ness through comic books. Moreover, Active comics put forth the idea of importance for those children who have brothers, fathers and uncles serving in war. The adolescent and pre-adolescents of Second World War read the comics eagerly. The comics provided that young audience, which did not read newspapers and had no television to watch, with probably their only source of information on the war. C.T. Legault (a). Front Cover Verso of “Thunderfist” Active Comics. No. 1, February 1942, Commercial Signs of Canada: Cover. Bell Features Collection, Library and Archives Canada. Moreover, Bell Features seemed to work in giving life and durability to these Canadian comic books and “looking back at them they were a significant piece in the puzzle of our Canadian-ness”(Kockmarek The war-time Comics of Bell Features Publications). Bright, bold and with colour only on front page, this comic reveals how the publishers wanted to get as much attention as they could for children to buy it. These publishers know exactly of what the comics provided and what type of audience’s the comics would have. Beaty questions, “Why superheroes? Why comics? They are not just entertaining fantasy figures. They are important to our history because they are symbols of our Canadian identity” (Beaty 431). Through making the superheroes play the role of what it means to be Canadian, this embraces the popular culture and makes children aware of what it means to be Canadian. Representing Canadian-ness was a brilliant way to let children, who were the main consumer’s to get a copy of this comic, engage with Canadian nationality. Beaty states, “Superheroes of the Second World War into legitimated representations of Canadian wartime aspirations that could be affectionately regarded in hindsight as examples of Canadian popular culture” (Beaty 431). According to Beaty, these superheroes were the finest way to represent the Canadian culture to children during the war. Dixon of the Mounted and Thunderfist were superheroes that fit the role to represent their Canadian abilities that children learned from. Active comics was a great source for children to engage and know what it meant to be Canadian, thus the only Canadian popular culture the children was being open too was the whole concept of masculinity features. The “Men of the Mounted” daily strip was created by Edwin Reid “Ted” McCall and drawn by Harry S. Hall for the Toronto Telegram on Feb. 13, 1933. 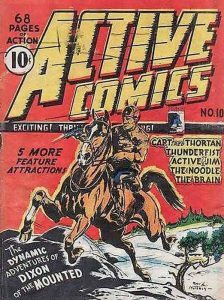 The two heroes in the Active Comic #1; Dixon of the Mounted and Thunderfist are adventurous and demonstrate the representation of masculinity throughout their stories in order to keep the Canadian ‘identity’. The first story in the issue, Dixon of the Mounted, plays out the strong and brave man as he is going through a blizzard in the mountains searching for his female companion, Ruth Barton. He was a Corporal in the Royal Canadian Mounted Police labeling for Canada then the beaver and even the maple leaf. Thunderfist opens up as a strongman and as a scientific man known for the strangest inventions. His abilities are his allow him to advance at great speed and makes him fly through the electrical currents. Thunderfist’s costume makes him immune to electrical attacks and he has an intelligent mind that leads him to create devices and his own costume. The realization of the need for mental and physical toughness on the battlefield demonstrates the presumed virtues of dominant masculinity for both Dixon of the Mounted and Thunderfist, which men bring to the military service. Both of these heroes portray what its like to be in Canadian popular culture through their intelligence and strength. Saying that, this makes them Canadian and the children take on that every soldier who fought in the World War two and was Canadian; they had to be like Dixon of the Mounted and Thunderfist. 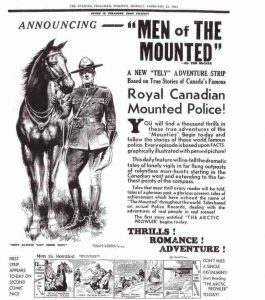 There was even aToronto Evening Telegram portraying Men of the Mounted, which contained a strip about the Royal Canadian Mounted Police. 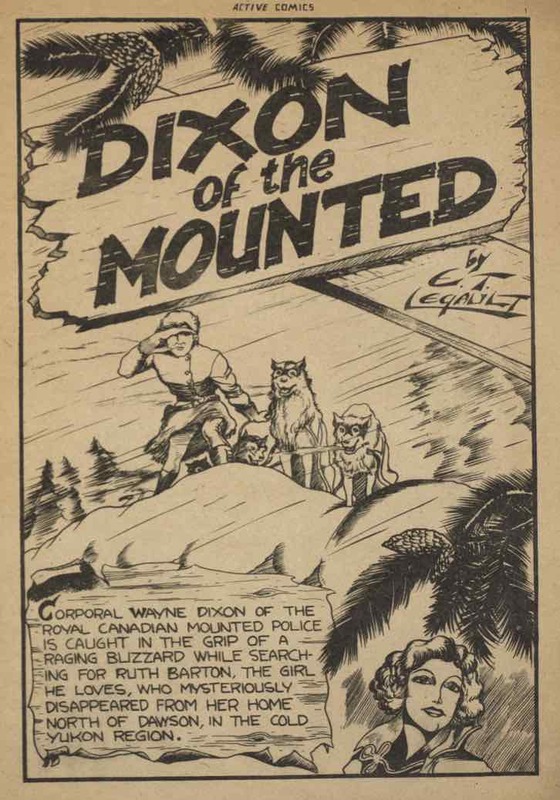 Dixon of the Mounted is a Royal Canadian Mounted police and through this telegram, it is portraying that the superhero is being advertised in a different media form than the comic. Kockmarek states that, “The ‘Men of the Mounted’ daily strip was created by Edwin Reid “Ted” McCall and drawn by Harry S. Hall for the Toronto Telegram on Feb. 13, 1933” (Kockmarek Men of the Mounted). 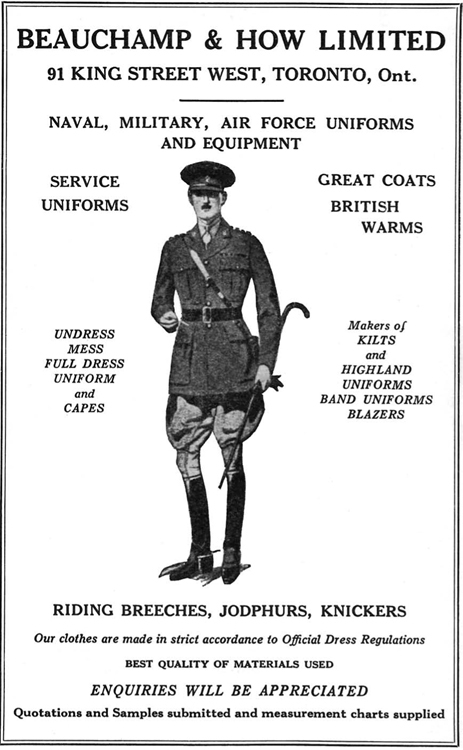 Dixon of the Mounted was so popular that he began to be advertised in other ways. Through both superheroes encouraging Canadian-ness towards children in a masculine way, this started to educate children they way the comic intended too. Active Comics #1 played a significant role in education a young populace before, during and after the war, encouraging the children that the soldiers that they would win and defeat their enemies just like the Canadian superheroes. Beaty affirms that, “The effect of The Oreat Canadian ComicBooks was twofold: first, it introduced into comic book fandom an awareness of the specifically Canadian contribution to the development of the medium during the war; second, it initiated an association between comic books and nationalism that would subsequently shape the discourse surrounding Canadian comics” (Beaty 431). Throughout the war, the comic book super heroes were involved in helping soldiers defeating their enemies. The representation of the superheroes action was always good, since they are fighting the evil enemies away. The characters always illustrated war aims and how children can be assured that their fathers or brothers were strong and would win the war because they are brave just like the Canadian superheroes. According to the article Part of golden age of Canadian comic books, “Peter Birkemoe, owner of the Beguiling comic book store in Toronto, said that during the war many artists like Riley realized the commercial potential of their comics…these were businesses, this wasn’t an art collective or art-driven,” (Riley Part of golden age of Canadian comic books). In compliance with Peter’s statement, the comics had a specific reason that they wanted children to look at which how the superheroes portray the Canadian popular culture in a masculine way. Children had the mindset that Canadian heroes would always win because of their strong Canadian strength and intelligence. Comics present combat most often as the business of ordinary men and the courage and ability to fight as intrinsic to all men. The Comic promotes the idea that every man, is able to rise to the occasion and defeat the enemy, but only if they have the Canadian-ness powers that Dixon of the Mounted and Thunderfist portray. Men of the Mounted” trading cards put out by Willard’s Chocolates which had opened in Toronto in 1917. The mobilizations of clichés that are in the place of these superheroes are substantial. 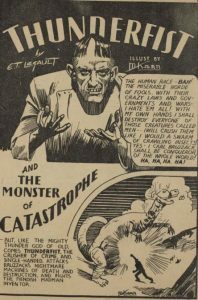 Active Comics mentions stereotypes with its two superheroes Dixon of the Mounted and Thunderfist and it is clear that the overt nationalism of Canadian superheroes in the contemporary era had as much to do with frustrations over sustaining a viable Canadian comics publishing industry as it did with representational issues of Canadian identity. For Canadian superheroes to partake in the discourse of Canadian nationalism, therefore, it was necessary for the proponents of those heroes to disavow cultural production. With these two Superheroes Dixon of the Mounted and Thunderfist the children were becoming aware that since these superheroes were Canadian they knew all about what it was to be a Canadian. The comics were demonstrating that these superheroes fought and thought like Canadians, since they were strong and intelligent because of their actions and were Canadian. Children were being drawn to all the masculine aspects of these superheroes which made them believe that all Canadian men were supposed to act as accurately as they performed. 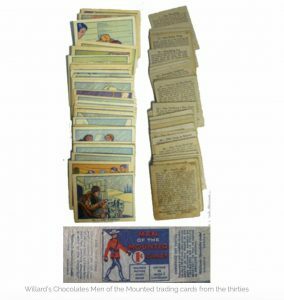 Furthermore, Willard’s Chocolates, a shop that opened up in Toronto in 1917 and came up with an idea of, chocolate with trading cards inside. Willard’s, “…came up with the “Sweet Marie” caramel and nut filled chocolate bar in 1931 and was eventually purchased by George Weston in 1954” (Kockmarek Men of the Mounted).The trading cards consisted of Men of the Mounted, which was inspired by the superhero Dixon of the Mounted; the Royal Canadian Mounted Police. Saying that, with Willard’s chocolates connecting to Dixon of the Mounted, it is portraying Canadian-ness. The superhero was being portrayed into popular culture through a company who sold chocolates with these trading cards in them. This idea was made because Dixon of the Mounted made great success in the first Canadian adventure strip to appear in Canada. With this being said, the superheroes were becoming popular, which was a great way to influence the Canadian-ness to everyone especially the children being targeted. These chocolates influenced children with their trading cards, which was a good way to get children involved with Canada’s popular culture. 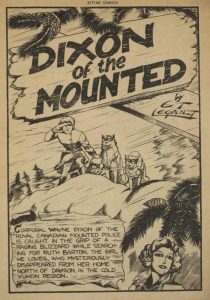 Conclusively, Active Comics Issue #1, examined the portrayal that displayed to children about Canadian popular culture through Dixon of the Mounted and Thunderfist encouraging Canadian-ness towards children in a masculine method. Canadian superheroes in the contemporary era had many clichés, in particular the masculine role that these two superheroes perform in order to demonstrate that all Canadian soldiers were brave and strong during the World War two. Through making the superheroes play the role of what it means to be Canadian, this embraces the popular culture and makes children aware of what it means to be Canadian. Representing Canadian-ness through these two superheroes was a brilliant way to let children engage with Canadian nationality. Saying that, these comic books limited the children’s concepts of what it means to be Canadian since it was being portrayed in a masculine way. Beaty, Bart. “The Fighting Civil Servant: Making Sense of the Canadian Superhero.” American Review of Canadian Studies, Oct. 2006, pp. 427–439., doi:10.1080/02722010609481401. Laurie, Ross. “Masculinities and War Comics.” Journal of Australian Studies, 18 May 2009, www.tandfonline.com/doi/abs/10.1080/14443059909387455. Legault, E.T. (w) and M. Karn (a). “Dixon of the Mounted and Thunderfist.”Active Comics, no. 1, February, 1942, pp. 1-29. Canadian Whites Comic Book Collection, 1941-1946. RULA Archives and Special Collections, Ryerson University, Toronto, Canada. 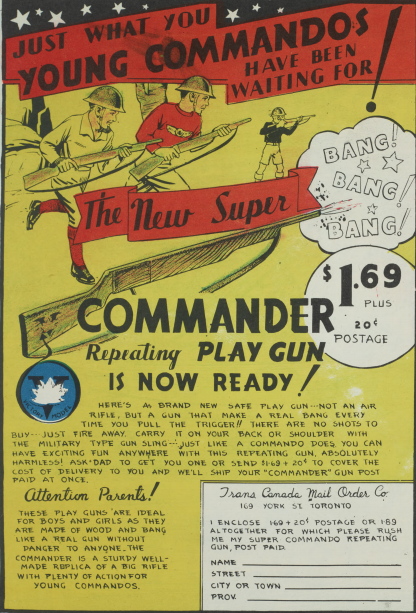 During the Second World War comic books were already in the pockets of the children of Canada and the United States. Heroes like Superman and Batman had already captured their imaginations with their stories full of action, adventure, and of course, dastardly villains. When the War Exchange Conservation act prevented those stories from coming through the Canadian borders. Children were left without their favorite heroes and villains, which in turn led to the creation of the Canadian Whites, Canadian comics which could have not competed with the colorful American comics before. The Canadian Whites brought with them new heroes and new villains for those heroes to fight. While everyone likes a good hero, what is a hero without its rogues gallery? Without the villains that fight against those heroes there would be no stories, action, no comics! Despite being written during a time of war however, the villains of these comics remained largely like those of American comics of the time, mostly divorced from the war happening at the time. Why is this? Using Active Comics #2 from March of 1942 as examples I will try and figure out why the comic book villains of the Canadian Whites were so strange and divorced from the very real enemies that were fought in the war at the time. In Active Comics #2 there were four stories, each featuring a hero and a single villain or a cabal of evil doers. The first story stared Thunderfist, a hero with super strength and flight fighting Dr. Bruzzack (Figure 1), a mad scientist attacking a New York City with robotic dinosaurs. 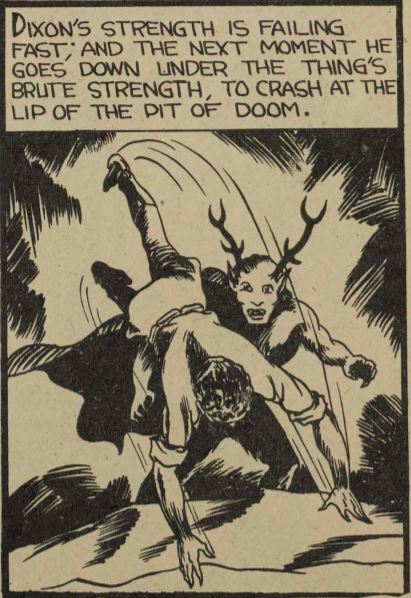 The second story featured a regular, if not extraordinarily brave Mounty by the name of Dixon of the Mounted who fought a demon known only in the story as “The Devil”, though this devil is unlikely Satan himself. 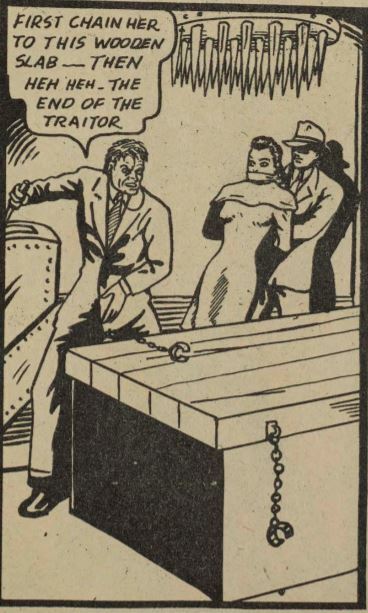 After Dixon’s story there is Captain “Red” Thortan, an incredibly athletic man with no discernible superpowers fighting against the Japanese army, and finally the is The Brain, a hero with super strength and clairvoyance fighting against a criminal organization led by a man known as The Saboteur. Only one of these villains is connected to the war, with two of them seeming much like standard comic book villains, and one seeming like a threat that could exist in the real world, if not for their over the top way of doing things. Why Not Focus on the War? It is important to note that the Canadian Whites were written, at least in part by teenagers and younger people in general, some of which would have enjoyed comics before the ban. While much of my information is about American comics of the time these younger comic creators would have likely been influenced by the comics that they read before, and even if they were older it would have made sense for them to mimic the style of comics that were already popular with children in the first place. Because of this despite the information that I will be using comes from studies of American comics, they are still viable for the Canadian comics of the time as well. Many villains of the Canadian Whites are similar to the villains that American heroes would be fighting at the time, in that they were usually divorced from the war, or were taking part in the war in less important ways than being at the front lines. Many of the villains in Canadian comics at the time were using villains bred from the same tropes and ideas that their American counterparts were using. Things like evil geniuses, gang leaders, and mythical beasts were popular types of villains in the Golden Age of comics, so it only comes to reason that these teenagers that are writing the Whites would write villains that follow these sort of archetypes. Due to the format of the comics having several stories in one issue, there was not a lot of time to develop these villains, so making them recognizable as a certain type of villain immediately was important. When Canadian comic books began to become popular due to the inability to import American comics it would come to no surprise to see comics with similar themes and characters. The heroes and villains of Active Comics #2 are no exception to this. In The Fighting Civil Servant: Making Sense of the Canadian Superhero Bart Beaty claims that “the concept of the man-god, a dedication to principles of justice, the secret identity, a conflict with the father, and the belief in the magical power of science.” (428) are key elements in superhero mythology. While the heroes don’t hit all of those traits they all hit at least one. The villains on the other hand are quite the opposite. Dr. Bruzzack certainly no “man-god”, using robotic dinosaurs in an attempt to destroy humanity, starting with New York City. Rather than believing in the “magical power of science” he believes only in himself, his robots being extensions of himself having been created by him. The Devil (Figure 2) appears to be no man, has no dedication to justice, or any of the above traits. 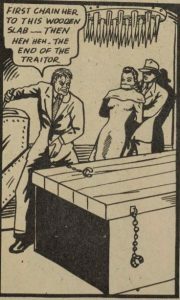 The Saboteur is no “man-god” either, relying on his gang for help, and threatens to kill a woman helping The Brain. These villains are meant to be the opposite of what is traditionally seen as heroic back in the Golden Age of Comics according to Beaty. Much like the superhero comics in America, superhero comics in Canada were in the golden age. While the Golden Age of Canadian Comics is differentiated from the Golden Age of Comics in America, they were happening in the same timeframe, the Canadian Golden Age happening between the years of 1941 – 1947, whereas the American Golden Age was happening from 1938 – 1954, both starting before and ending after the Canadian Golden Age (Fennell 305). This means that both Golden Ages were happening during the time of World War II. So the question remains: Why weren’t the villains in these stories representative of the war? Why are the most of the villains in Active Comics #2 divorced from the war that was going on at the time? Why would the heroes ignore the people fighting and dying against fascism? The reason, according to Jason Bainbridge in “The Call to do Justice”: Superheroes, Sovereigns and the State During Wartime, is because of the things that made them “super”, their superpowers, which could easily allow them to singlehandedly end the war, which could somewhat diminish the efforts put in by real soldiers on the battlefield (751). It was for those reasons that superheroes were often stuck fighting crime or monsters on the home front rather than helping with the war effort. Even those with no superpowers such as Dixon of the Mounted were still much more athletic and competent than any real man. Even when heroes were allowed to fight the same enemies that the soldiers were fighting in the real world they were often relegated to stopping either far-fetched schemes that only a superhero could stop, like the aforementioned robotic dinosaurs, or schemes that had little to do with the actual war effort, like capturing the daughter of a British commander, often to mask the horror of what the real war was like (751). Now that we know why superheroes rarely interacted with the war directly, choosing to instead help the home front, why are the villains that they fight so outrageous? There are several reasons for that in fact. One reason is that the heroes of the time needed to be demonstrably good. In the Golden Age it was thought that heroes needed to be selfless and aid others who needed it because if they didn’t, then that character was not truly heroic (751). For villains to come in line with that line of thinking they had to be outlandishly evil. For example Dixon of the Mounted finds himself fighting an actual demon in Active Comics #2, even going as far as to call it “The Devil”. Even the less obviously evil villains in this issue are still extreme in their villainy. The Syndicate from The Brain story have James Bond villain style machine to kill those who betray them (Figure 3), and Dr. Bruzzack attempts to destroy New York City with robotic dinosaurs. Strangely the villains that have the least dastardly plans is the Japanese army that Captain “Red” Thortan fights, who have only kidnapped the daughter of a British commander, but still fall under the category of “plainly evil” by merit of being part of the Axis Powers. The villains of Active Comics #2 did not view themselves in anyway but evil. Another reason for the villains being divorced from reality is that the heroes, and therefore the villains as well, are based on standards of justice of the time they were made (“Superhero Comics” 333). The morality of the time for fiction was influenced by Judeo-Christian ideals, combining the above self-sacrificing hero, with the idea of a crusader against evil, according to Ryan Edwardson in The Many Lives of Captain Canuck: Nationalism, Culture, and The Creation of a Canadian Comic Book Superhero (187). As such it would make sense for the villains that they fight to be the opposite: Self-serving, and completely evil, the perfect enemy for a self-sacrificing crusader against evil. While not all of the villains in Action Comics #2 are necessarily self-serving, with The Devil appearing to be a beast who mostly relishes in evil acts, with it saying nothing throughout the story and having torture implements in its lair, they are all most certainly evil. Dr. Bruzzack wants to kill all humans because he hates them, and The Saboteur is the leader of a group of gangsters who are going to kill a woman for betraying them to help The Brain. It seems that the answer to the question of why the villains in Active Comics #2 is simple. They were divorced from both the war, and in many ways reality, because they had to be at the time. Both heroes and villains of the Golden Age, both Canadian and American, were simple in their conception. The heroes were meant to be the ultimate forces of good, being self-sacrificing and forces for good, and the villains had to be the opposite of them, self-serving and evil. Their villains were not made to be villains that would have any place in the war so that the efforts of the soldiers in the war would not be diminished, and even when they did participate in the war it was in ways that did not directly affect the war effort itself. The heroes could not use their powers to end the war themselves, and so the authors had to find some way to make sure that they could not, and that way was to simply make other threats that were bigger or more immediately dangerous such as Dr. Bruzzack’s robotic dinosaurs, or that were closer to home, such as The Devil or the Saboteur, both being in Canada, and both being immediately dangerous for the people on the home front. Beaty, Bart. “Superhero Comics.” Fueling Culture: 101 Words for Energy and Environment, edited by Imre Szeman et al., Fordham University, NEW YORK, 2017, pp. 333–337, www.jstor.org/stable/j.ctt1hfr0s3.93.